Helps relieve foot, ankle, knee, hip, and lower back pain due to arch abnormalities. 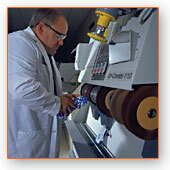 Advance Tech orthotics are made from a special nylon blend. This engineering breakthrough allows for construction that combines the flexiblility and comfort of a soft orthotic and at the same time maintaining its corrective form as a rigid orthotic. This combination is ideal for all ages and activities at work or play. Best of all our orthotic is designed to fit in all your footwear including boots, heels, work, dance , and athletic shoes without needing larger footwear to accommodate the orthotic. There is no bacterial buildup, easy to clean and they will not absorb odors. HEEL CUP: Specifically engineered to maximize the body's natural shock absorption. Integaral to controlling excessive pronation and/or supination. CALCANEAL-CUBOID ARCH: An effective preventative measure against heel spurs and PLANTAR FASCITIS. Holding this critical arch in position promotes proper body posture and efficiently transfers weight from the rear foot to the forefoot. FIFTH METATARSAL POCKET: Protects and holds the base of the fifth metatarsal in a neutral and healthy position... crictical in establishing and maintaining a healthy longitudinal arch. POSTERIOR METATARSAL ARCH: The orthotic rises to support the metatarsals, thereby creating or maintaining the natural curvature necessary for optimal weight bearing and transfer. METATARSAL BUTTON: Prevents and/or relieves the pain associated with corns,calluses,BUNIONS,and Morton's Neuroma. Improves circulation throughout the foot. INTERNET PRICE: $289.00 PER PAIR. Office price $349.00 per pair. Save $60 Includes casting box and fitting. 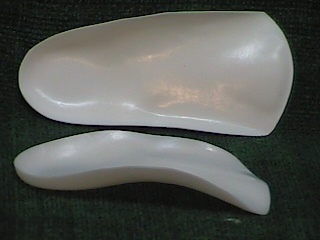 One pair of Advance Tech custom fit orthotics and one way postage from lab. The $20 casting box deposit (see below) will be credited towards the total price. Optional orthotic replacement program available for an additional charge. Washington residents add 8.6% sales tax. The Advance Tech orthotic is warranted 15 years on normal wear of the product. If the original product fails under normal use & conditions we will correct or replace it and provide most adjustments we deem necessarry at no charge to the original client. Posts, Covers, & Postage Excluded. As this is a custom fit product and because of the nature of infectious diseases, our orthotics are nonrefundable. Charges for unadjustable orthotic replacements and future fitting supplies may apply. Call or write for your casting box (press ordering link). A $20 non-refundable deposit is required for a casting box and will be applied to the total purchase price. When you receive your casting box follow the instructions and mail with completed information and balance due to our lab. Your personal data and our requirements for fittings are strictly confidential. Want a second pair of custom fit Orthotics? E-mail for a special price for our original clients only.